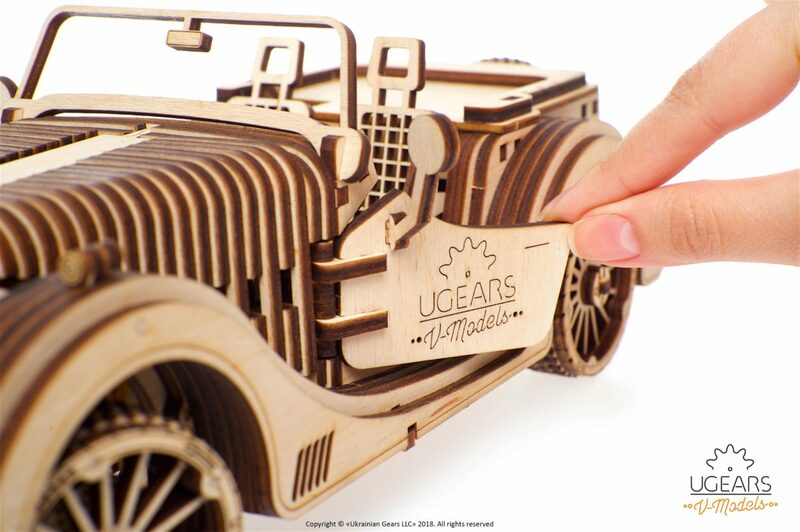 If you are a fan of classic cars and custom-made technic, UGears Roadster VM-01 3D puzzle is sure something that won’t stray away from your gaze. 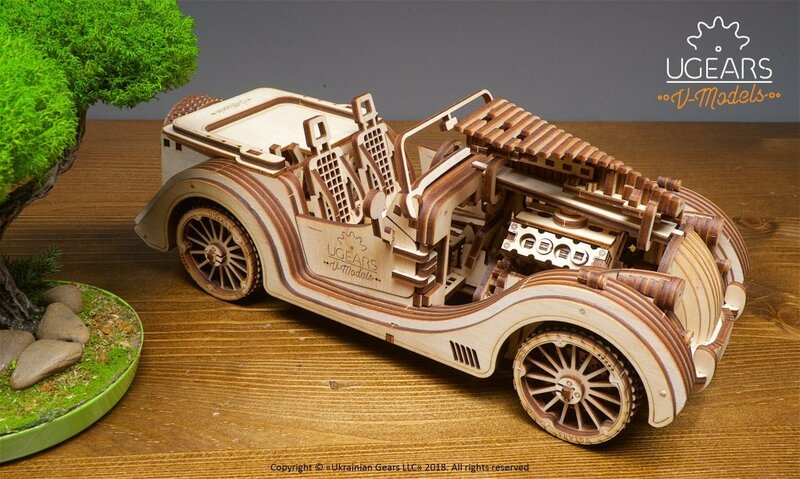 A unique puzzle, made entirely of wooden parts that can not only become an off-beat element of décor, but a functioning model of a legendary vehicle with unprecedented power underneath its hood. What makes it so special? Let’s find out. What makes Roadster VM-01 model special? – This model was made with maximum precision and attention to detail, its doors can be opened, the dashboard boasts stunning detail, making the model look as realistic as possible. Once assembled it is ready to become an elegant table decoration in your living room or office. But magic doesn’t just end here. Note the wide hood of the Roadster VM-01 model, lifting the hood will reveal the engine pistons at work – a stunning feature added by designers! All Roadster VM-01 parts undergo only three processing steps: milling, grinding and scorching. The contrasting elements of the model haven’t been painted on but are a result of wood darkened by high temperatures. This approach helps the manufacturer achieve an aesthetically pleasing and instantly recognizable look while keeping the product environmentally friendly and safe. We invite you to visit our company’s catalog and browse through dozens of other equally impressive 3D puzzles in a wide variety of thematic subgroups. All of them can be ordered directly from the pages of our catalog.